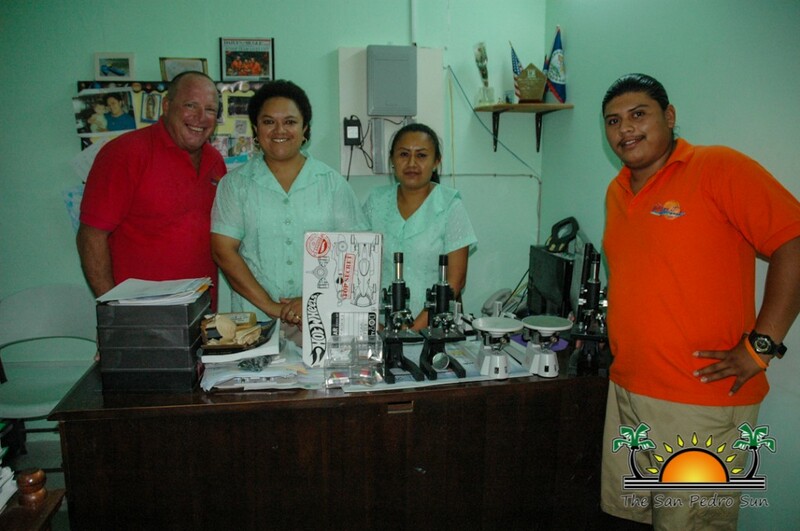 Belize It Yourself.com (BIY), San Pedro's only Personal Concierge, travel-related business, has again shown its intention to establish itself as a supporter of education and the future of island students with a focus on Science. As such, the company donated an assortment of scientific equipment to the San Pedro High School (SPHS). The donation was handed over to Vice Principal, Conchita Flota on Wednesday, April 29th. Partner of BYI, Scott Deutsch hopes that the donation helps improve the level of education students receive at SPHS. "As a Global Warming scientist, and former Middle School teacher, I admire the efforts of every student I have met here in San Pedro. Their hunger to learn, as proven at their Science Fair, including the use of the Robotics Kits, inspires us at BIY to do all we can to help. No matter what field these students choose to enter for their careers, a business background is always important. Perhaps in the future, some of these students may choose to work as interns for Belize It Yourself," said Deutsch. The donation included microscopes, triple-beam balances, assorted bar magnets, solar prism kits, and an optical light box (that shows students how harmful rays from the sun penetrate the atmosphere). Together with partners Roannie Espejo and Edvin Mendoza, Deutsch indicated that BYI will continue to help schools on the island with materials and their time helping students in the future.